Classic shirt in two simple colour variations for those of us who are Blutsbrüder! The snugly fitting cotton shirt with press stud placket and a small breast pocket on the right front side is an indispensable clothing item that belongs in every man's wardrobe. 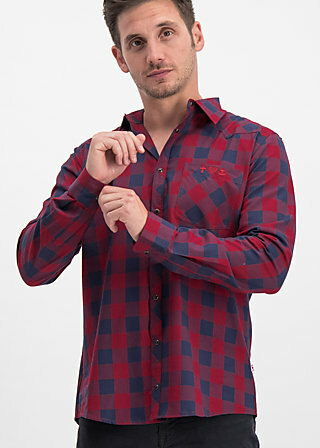 Whether in traditional black & white or in the cool red/blue 'logger' look – with this timeless checked shirt we have created a favourite clothing item for all men. A discreet, embroidered logo on the breast pocket shows our attention to detail and gives every Blutsbruder a healthy dose of faith-love-hope. Our styling tip for all Blutsschwestern: Understated and simple as a casual oversize shirt or, optionally, combined with a figure-hugging waist belt, the checked garment will also be a favourite, cool it- piece among the beloved ones of your beloved ones in no time!